If you are using the latest version of Mac OS and you try to install a new app manually, you may see an error message that says, App Can’t be opened because it is from an unidentified developer. If you see this error then its actually good for you as this security feature, introduced in the latest version of Mac OS, prevents automatic installation of Malware on your Mac machine. But there are only limited number of apps available on Mac App store, and you may need a lot of other third party apps, its very annoying and time consuming to close this popup every time you try to install something on your Mac. To fix this issue, go to System preferances > Security and privacy. In General Settings click on the lock icon. Now in ‘Allow applications downloaded from’, select ‘anywhere’. 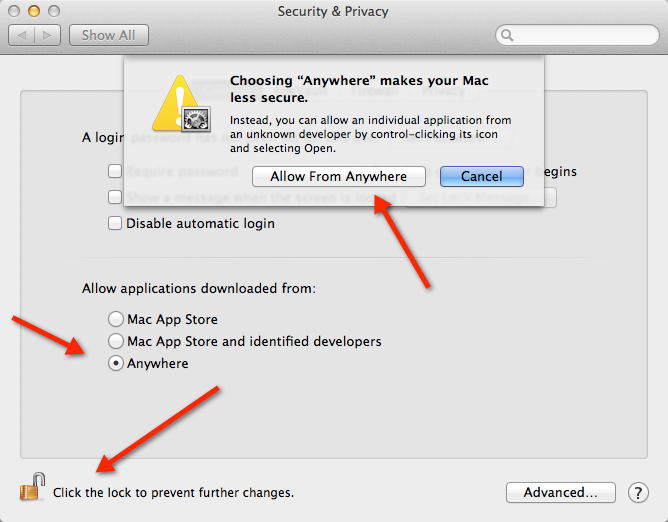 In the verification dialog, select ‘allow from anywhere’. That’s it. 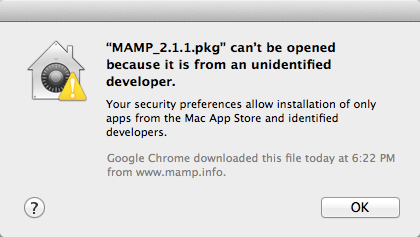 Now you will never see this error while installing any app on Mac.